Memorial Day celebrations are just around the corner and the 4th of July will be here before we know it. These Fireworks Cupcakes would be fabulous treats for either holiday! I am always looking for a colorful treat to serve on our patriotic days and these red, white and blue cupcakes would be absolutely perfect. Plus, they are fast and easy to decorate. Janette from CulinaryGinger.com shares her red velvet cupcake recipe as will as her frosting and decorating instructions. 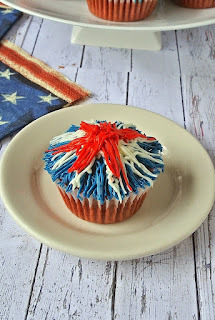 She even tells us which Wilton piping tip to use in order to recreate the design you see on her firework cupcakes pictured here in this article. Children love taking part in preparing for a party or picnic. These firework cupcakes would make the perfect way to let them participate. Since fireworks themselves are not exactly uniform in shape and size, these fireworks cupcakes would be ideal to make with kids. No one would have to stress or strive for perfection. You could even have a pre-party decorating party for them with a few of their friends and let them try their hand at decorating the cupcakes with the stripes of red, white and blue. They might surprise you with their own unique design and you certainly will have created a memorable occasion just for them. 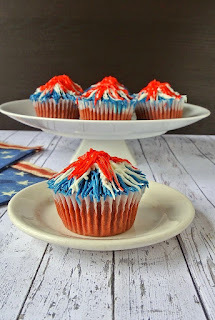 Not only would you all have fun decorating the firework cupcakes, but the whole group of family and friends will have a delicious dessert for the actual patriotic picnic or party. One last thought, be sure to have your camera ready when the kids start decorating. You never know what "fireworks" might happen in your own kitchen that you will want to have forever documented in a scrapbook. What a fun dessert to make for patriotic holidays!